It is that time again. Shedding season has begun in my household. I know, I know, it’s a year round thing when you have larger dogs, but the excessive shedding has been going on for a few weeks now. With the weather starting to turn nice, I had my patio door and my front door open at the same time and watched the fallen hair travel all around my hardwood floors. When you see it on the floor, you know it’s on the furniture too. I keep blankets on all of the living room furniture to catch the hair, but sometimes Bella decides she wants to do some rearranging and pulls it off to find herself a more comfortable spot. Back in 2015 I created a video showing my technique to removing dog hair from my couch. It was one of the first videos I ever shared. I did not have any editing skills, still don’t really, but the end result was still OK. I happened to see it today when I was looking for a different video and thought it was a perfect time to share it again. Hope the tip works for you. Do you have another method you prefer? Share in the comments. I’ve never been a resolution person. I didn’t need a “date” to tell me to start doing something better. For me, the decision was made due to an entirely different problem. Mice. Yes, mice. Those annoying little rodents had decided to take up residents in my home and in my quest to stop them, I decided I had to make a change. As I tried to catch them, I realized I had a lot of JUNK in my way! I’m not a dirty housekeeper. I keep dishes washed, food put away. I’m a pack rat (no pun intended) and tend to throw stuff in boxes, bags, things I should either use or throw-away. I tend to keep things with the thought I’ll use them later. I receive free samples & instead of using them, I save them, thinking to myself, “I’ll save it and use it for __________” only to forget about it and find it months later, often no good or expired. I buy things on sale thinking “I’ll use that for _________ but ________ never comes” so the item ends up going to waste. I made a resolution a few weeks back to make a change. It was time to get the house organized. It was time to make sure I use the items I purchase. Even the free stuff I receive for whatever reason; I am going to use it, donate it, give it away to someone, or throw it away. I made the resolution but did NOTHING to change it right away. Then, slowly, I started seeing the house differently. I saw the dust more. I saw the dog hair on the floor. I know, I know, that’s cleaning, not organization, but it all goes together. I started sweeping and dusting more often. I started putting things away. I looked around and it all looked a little overwhelming. Where to start? It is difficult to get organized when you aren’t a organized type of person. When you are a “throw everything into a box to look at it later” person it isn’t easy getting started. The Internet is a great place to find suggestions. You can get some wonderful ideas, ideas that appear simple, until you get started. 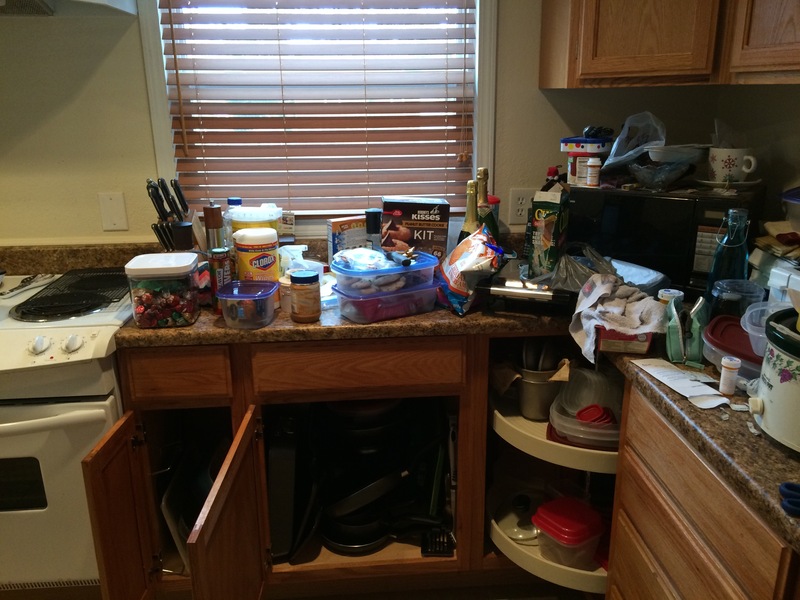 Then you realize….I will NEVER be THAT organized! Is it tempting to give up when you have those thoughts? YES! Here is my advice. DO NOT GIVE UP!!! Ha, yes, I know it’s easier to say then do, so let me try some better advice. The first thing to do is to accept this as fact; organization isn’t your forte. It’s OK. It isn’t a big deal. You can still make it work. Search the Internet for ideas. Look for realistic ideas. It’s nice to have goals but let’s face it, if it’s too difficult, you will stop half way and never go back. Find plans YOU know are obtainable for YOU. Start small. 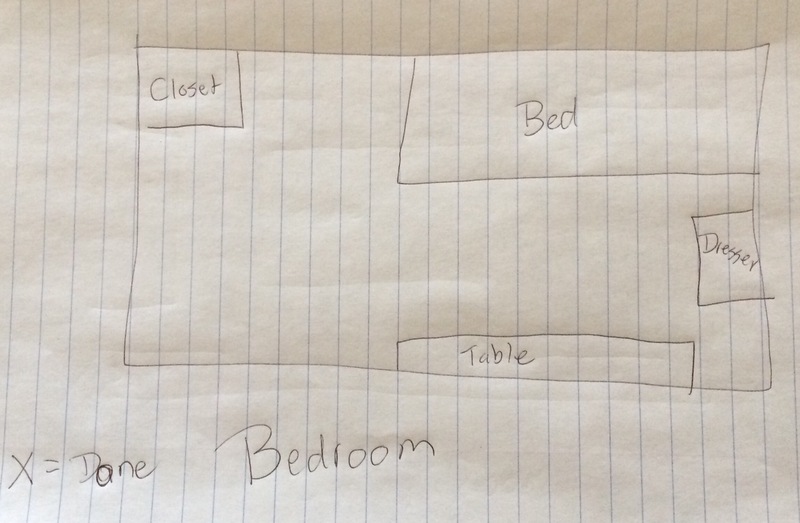 Instead of saying, “I’ll start with this bedroom” start with the bedroom closet. Yes! I said a closet. If you are anything like me, a closet in your house probably holds more than one box filled with unnecessary items. By starting with something so small, you will be able to get through it, complete it, feel good about it, and feel motivated to keep going. Don’t get distracted. Again, if you are anything like me, reality is you start in one room and end up in an entirely different room. How many times have you started cleaning / organizing a bedroom only to wind up cleaning your stove?!? Nothing gets done. You wind up frustrated. The cycle repeats. Start prepared. For the person who HATES cleaning / organizing, it is easy to find an excuse to stop. Trust me, I get it. I honestly think I have a slight form of adult ADHD and can stop simply because I get distracted. <—-see what I did? Came up with an excuse to stop before I even truly got started! It is so easy! Back to preparation. Are you a list person? A visual person? I have learned to appreciate lists but I am more of a visual person. 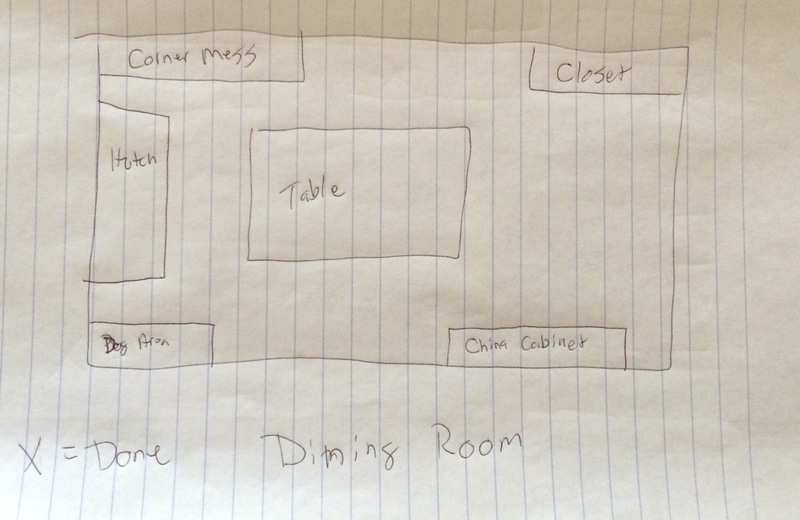 For me, I started out with drawings of each of my rooms. 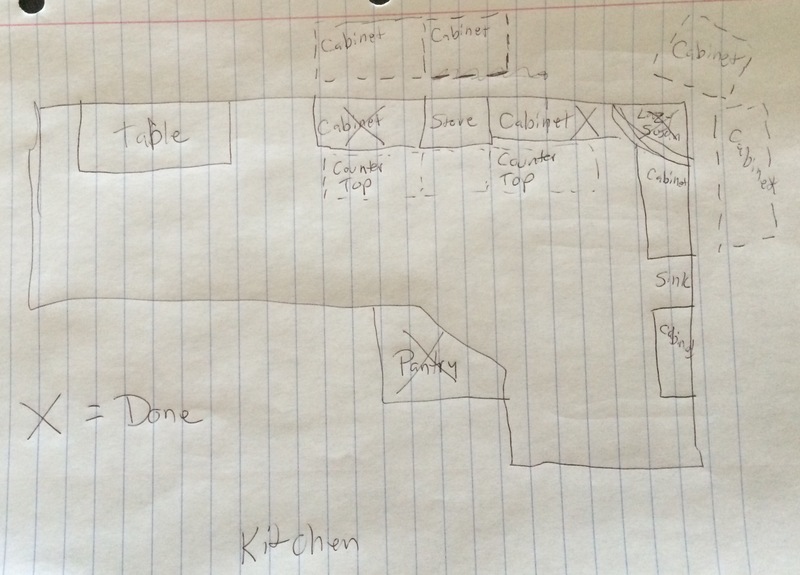 I draw out the closets or items that will need organized. For example, if you have a dresser, make that a “room” in your mind. Trust me, one dresser could be as annoying as a whole room sometimes. Ok, you get the idea. Break it down to manageable areas. Stick to your chosen area! Do not stray. Have boxes ready. One for trash. One for donations. One for items you want to sell. Then have boxes ready for the other rooms in the house. Do not take the items to the room when you pick them up. Put them in the box labeled for the room it is going to. Remember the “easily distracted” problem? I have learned not to follow the thought, “Only touch an item once” style. Those that can, it’s great. They are the ones who end up with picture perfect homes. I am not such a person. I will walk away and never make it back to the area I started in! Do not do it. Resist temptation. Put the item in the appropriate box. Do not go and make a spot someplace else for something. Only focus on the area you are working on. If you know you need to make a spot for something coming into the area you currently at, make the spot, but DO NOT go get the item (unless you need it for sizing). Once you are done, admire it. Will it be picture perfect? No. You aren’t that kind of person. Will it be organized? Yes! So you have accomplished your goal! It doesn’t have to be picture perfect, just perfect for you. Be proud of your accomplishment! Now to deal with the filled boxes. Empty the trash box first. You do not want an opportunity to second guess yourself! Yes, I know it happens. Dump the box into a large trash bag and put something icky on top of it so you aren’t tempted (if you need to). The donate box should be taken to the appropriate place right away unless there is only one or two items. The quicker the box is gone, the less likely you are to second guess yourself. You may want to consider having two different donation boxes. For example, I have one for goodwill and another for a local animal shelter. Old sheets, towels, etc can be used at an animal shelter. If the item can be repurposed instead of throwing it away, that is the best. You may want to check your local free cycle website before you take the box someplace. There may be some local Facebook repurposing sites, look for them as another option. The sell box is the dangerous box. Too many times, we box something up for the yard sale we never have. Yes, I know….you’re going to have one but…. Been there. Done that. Instead of saving it for the yard sale, look to see if there is a local social media site to list the item on. In Kansa City, you can use KC Virtual Yard Sale. Another way is to post the items on Craigslist. It is best to put the price you want or best offer. It doesn’t matter how big or how small the item is. Put it on there. If you are not set on making money for the item, check local repurpose sites. Keep the box to the side for one week. If no one responds in a week, you should consider donating it. If you are still intent on selling it, move it to a larger “sell” box and put a date to donate on it. (No more than 6 months). Try to repeat the sites mentioned above again in 60-90 days. Remember to update the listings on social media & Craigslist as you sell or get rid of the items. If you do sell the items, be smart about it. Do not allow people you do not know into your home. Meet at a local store parking lot to exchange the item. A place you know has cameras. Preferably in the daytime. TRUST YOUR GUT. If someone or something feels strange, don’t do it. Don’t rationalize. If you are truly not comfortable selling the items online or they are larger items, consider talking to a consignment shop. They will give you an idea if it’s worth selling or not. Take the other boxes to the next area you will be working in. DO NOT TAKE THEM TO THE ROOM THEY ARE INTENDED FOR. You only take the box there when you are ready to start in that room (or one of the areas in the room). If you are like me and know you will lose focus quickly if you spend too much time in one area, break up the areas. For example, do a closet in one room, then do a dresser in another room. Pick a difficult area one day / time, then an easier area the next. There are no rules stating you must finish a whole room before you move to another one. That is why smaller areas are so important. The most important think is to keep going. Don’t get discouraged. You should have a designated holding area for the items you have listed on social media / Craigslist. The area should be neat. Keep the boxes and items stacked up. There will be items you just do not want to part with. It’s ok. Sometimes you just have want to keep stuff. Get a few plastic bins, nothing too big. They should be stackable and liftable. Label the boxes. Store them in a safe area away from extreme temperatures and possible water damage. Before an item goes in there, really think about it. Is it a memory you are holding on to? Is it something you want to pass down? What is the real reason you are keeping it? Could someone else benefit from having it? Those questions should be answered BEFORE you decide the item is “keep forever” worthy. Only YOU can truly decide why or what you want to keep. It doesn’t have to make sense to someone else, but it does have to make sense to you. Remember to check off the areas as you complete them! Celebrate your accomplishments! Here is a picture of my kitchen counter top and one cabinet. I didn’t make it messier to make the finished project look better, but I had just returned home from being gone and I was piling a lot more on my counter with Altoids all around them to keep the mice away. I will be posting updates as I move forward with each area. I hope they encourage you to start as well. It also keeps me accountable to getting it done. I started with the kitchen because of my mouse problem but there is no right or wrong place to start. Leave comments as you move forward with your own cleaning / organization. Have a great 2015 and beyond!